A major street project in Palo Alto has reached Arastradero Road, a popular route to and from Foothill Expressway. The city has reduced the number of traffic lanes between El Camino Real and Gunn High School from four to two in some places and three in others, and the reclaimed space has been used to widen the bike lanes -- especially the northbound lane, which has been notorious for running into the concrete curb and having bumps and ruts that have sent more than one rider to the ground. A new black slurry seal surface has also been applied to the street, eliminating some of the very noticeable washboarding that cyclists experienced heading southbound. These changes should make Arastradero less stressful for cyclists, whether solo or on group rides. Update: The official results and ride report have been posted. On most summer mornings, there's that moment driving Highway 17 south toward Santa Cruz when the low clouds and fog roll in, socking the coast in a dreary drizzle. Even though it's entirely expected, it still was a disappointment as I crossed the summit at about 4:45 a.m. and had to turn on the windshield wipers. That set the tone for much of my first attempt at a one-day 300-kilometer ride up and down the coast -- a day that felt more like February than August. The Buena Vista 300k is part of a series presented by Santa Cruz Randonneurs, a group I last rode with in August 2008 when I completed a 200k brevet. Saturday's ride was, according to regional brevet administrator Bill Bryant, the group's largest event ever, with 55 riders. 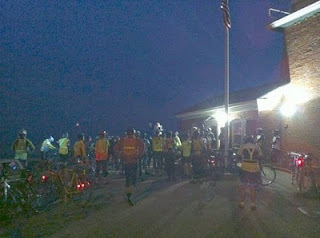 As we gathered at the Santa Cruz lighthouse in the pre-dawn darkness, there was a huge variety of bicycles, cyclists, and apparel; seasoned randonneurs know that having a successful ride trumps any possible fashion statement of the type you'll find on so many Bay Area casual cycling routes. Because we started before dawn -- and because most of us would not finish the route until after sunset -- Randonneurs USA rules (and common sense) mandated a whole boatload of night-riding items: headlight, taillight (set to a battery-eating solid only; no flashers allowed), reflective vest, reflective anklebands, and even backup batteries. So our oddly-reflective group of riders set out along the oceanfront at 6 a.m. on our journey's first leg: up the coast to Half Moon Bay and back. I graciously lingered and let most of the faster riders go first; no point in damaging my self-esteem so early in the day. Despite the weather and the daunting task before me, I started the ride in a reasonably good mood. But that didn't last long. Not even a mile, in fact. Just before we turned onto Highway 1, I looked down and discovered that my cycle computer was showing a speed of 0.0 mph and had registered a distance of only 0.79 mile! Was my Cateye headlight causing interference (even though it hadn't done so on last week's test ride)? Did some other rider's equipment cause a problem? Had a sensor come loose ... or had the jury-rigged transmitter holder, lovingly fashioned by the mechanics of ALC9, fallen off? I pulled into a side street, played with equipment for a couple of minutes, and couldn't find anything wrong. This was a bad sign! Not wanting to lose precious time at the start, I returned to the route, riding essentially blind. This was going to be a very bad way to spend the day. And then, about 4 miles into the route, the computer display changed ... and displayed the low-battery icon. This made me happy! Why? Because, in my quest to overpack every possible item I'd need for the day, I had stashed an extra 2032-size watch battery (the kind my computer uses) in my saddlebag. Another quick stop by the side of the road, and I had a working cycle computer -- albeit one that now was off by 4 miles. I've written about cycling on Highway 1 before, especially just a few weeks ago when the ride put me in a most foul mood. Saturday's conditions were actually less favorable, but traffic was very light due to the very early hour. Also, because my northbound experience was so recent, I knew exactly where each of the hills would be, and I knew how much steepness to expect, and that provided a big psychological boost. Soon enough, I was riding past the Pescadero turnoff, even though the drizzle periodically was becoming thick enough to almost qualify as showers. Fortunately, there was practically no wind. The ride organizers called the route "lumpy," and the next part of Highway 1 certainly earned that title. 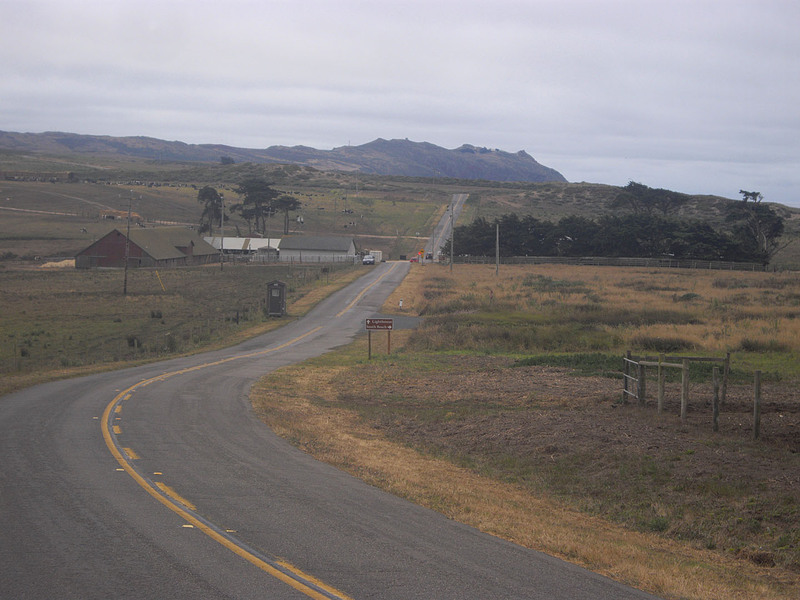 Most of the hills between Pescadero and Half Moon Bay aren't especially long, but nearly all of them are somewhat steep, with grades of 7% to 10%. That's above my threshold for enjoying hills, and the wet conditions didn't help. My jacket and leg warmers were soaking wet, and I started to fantasize about finding a laundromat in Half Moon Bay and running my clothes through the dryer for 10 minutes. But as I arrived in Half Moon Bay just after 9:30 a.m., no such location was visible, so I stopped at the first official control point, a specific mini-mart where the RUSA rules required me to collect a timestamped receipt to prove passage. My receipt read 8:16 a.m. -- oops! A few other riders were still there, and a quick survey revealed that other riders had the same problem, so I decided it wasn't going to be a big issue. I logged the time, filed the receipt, and was quickly back on the road. The next part of the trip was simply retracing our route back to Santa Cruz. By now, however, the drizzle had mostly stopped, although it was still cloudy and chilly -- enhanced by my still-cold clothing. Every hill that was an annoyance on the northbound route was one in the other direction as well. And the wind had started to pick up out of the north, giving me a gentle boost. But as 1 p.m. approached, I was back in Santa Cruz and nearing the 100-mile mark, where it was time to deal with the terrain and the local traffic. Before the ride, I had predicted that this would be the most likely place where I'd abandon the ride, because it would be all too easy to summon my helpful driver (and via-text-message support person) Adam, who had graciously agreed to be on call if I needed to give up. Surprisingly, I entertained very few such thoughts. Instead, I was more focused on a specific Subway restaurant I had earlier located along the route. I knew that a plain meatball sandwich -- the comfort food that saved the day for me on ALC8 in Morro Bay -- was in my future. It indeed was, and the rider who was near me at the time was also grateful that I knew about this place. The "controls" of a brevet are different from the "rest stops" of ALC or other supported rides. The purpose of a control is solely to prove passage and prevent riders from taking shortcuts; while food and drink are usually available at most of them, there's no obligation to designate control points at reasonable intervals for nutrition and hydration. 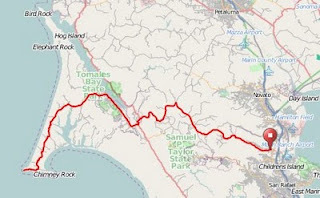 In fact, due to the unusual layout of Saturday's route, there was a gap of nearly 90 miles between controls, from Half Moon Bay in the north all the way down to Marina in the south. Organizers can set up one or more "secret controls," and with this 90-mile gap, I was fully expecting one somewhere around the Santa Cruz area, but none was to be had. With lunch taken care of, I returned to the streets of Santa Cruz and Soquel. With the clouds starting to break, I finally shed my jacket, revealing my ALC9 jersey. Like so much of the coastside, the hills are mostly short but annoyingly steep. 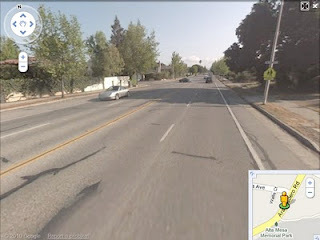 Here, the hills are made worse by the often-inconsistent quality of road surfacing. Leaving Santa Cruz is one of my least favorite parts of ALC, but I've now done it enough times that this part of Saturday's ride was unsurprising. At one point, I heard, "Yay, ALC!" behind me as one local rider (at least, I think she wasn't part of our group) passed me and was wearing an ALC8 jersey. I've now done enough rides of more than 100 miles to know that the next part of the day would be difficult. A voice in my head started to wonder why I hadn't abandoned the ride back in Santa Cruz when it would have been easy to do so. I thought about the 90 miles still to go and wondered what the hell I was doing. And at one point, a massively sharp pain shot through the side of my upper left leg -- a knife-like feeling that I'd never experienced before while riding. Fortunately, it didn't recur, and I started to ponder the intermediate milestones that could make the ride a success even if I didn't finish: a 200-kilometer double metric, reaching the turnaround point at mile 145 in Marina, matching the 160 miles of Ride Across Indiana, and so on. My favorite part of the day came when we turned onto Highway 1 southbound to head through Moss Landing. This part of the highway comes just after the southbound freeway has ended and traffic has been funneled into one lane heading southbound. On all of my past ALC rides, the highway has been full of scary, high-speed traffic, including lots of large trucks. Saturday, however, traffic was nearly at a halt, presumably due to the influx of weekend warriors. Through nearly the entire 6-mile stretch, I was going faster than the cars! A quick stop marked the 200-kilometer point of the ride; my time was about 10 hours, an improvement from my 11-plus hours of 2008. The wind was beginning to work more in my favor now, and as I passed the artichoke stop of ALC legend on the way to Marina, I was in reasonably good spirits as I noticed a mini-paceline approaching in the opposite directions. Spotting the reflective gear and the route sheets on the handlebars, I identified the riders as part of our group. Some quick math told me that I was still about 20 miles from the turnaround point, which meant that these riders were -- gulp! -- about 40 miles ahead of me. On the other hand, they were laboring into the wind, which for them was a challenging headwind. I, on the other hand, continued to enjoy the growing tailwind as I breezed into Marina and the next control point. Next was the one part of the route that I'd never done before. When ALC passes through here, we detour into Salinas for our lunch stop before beginning the long trek down River Road. Saturday's route went directly from Marina to River Road, cutting several miles off the distance and traveling through the former Fort Ord. Reservation Road is a divided, four-lane highway that has either a wide shoulder or a separate bike path for the entire distance that ALC uses. But beyond the split, we continued on Reservation Road, where the shoulder ended, forcing us into one of the two southbound traffic lanes ... and the speed limit increased to 60 mph! Although traffic was mostly light, the few occasions when side-by-side traffic approached were somewhat harrowing. After just a couple of miles, at the edge of the old fort, the highway suddenly dropped back to two lanes, and the shoulder mercifully reappeared. Now I know why ALC doesn't use that route! Afternoon winds in the Salinas area are typically strong, and Saturday was no exception; as 6 p.m. approached, I was easily cruising down River Road at 25 mph as I rolled into the control point at the southernmost point on the route: the last gas station and mini-market for miles and miles. A steady line of riders had been coming at me in the opposite direction for miles, so I was being serious when I told the busy attendant who made my delicious ham sandwich, "I think I'm the last rider you'll see today." I was wrong; three more riders arrived while I was eating, which also boosted my spirits somewhat. But there was the matter of the wind. I was 48 miles south of Santa Cruz, and the wind was whipping out of the north. However, I still had eight hours to go before the 2 a.m. cutoff time. I could take a gamble and wait a while, hoping that the wind would die down, at the price of feeling more pressure to meet the cutoff time -- and keeping Adam waiting for me even longer. I decided that waiting wasn't worth the trouble; any time spent in motion at any speed would be better than time not in motion, so I began the slow push northbound into the wind. And I started to see more riders coming toward me! Five, six, seven, and finally eight. But the going was indeed slow. And the hill on Reservation Road leading into Marina was especially difficult and tiring; I stopped at a turnout partway up and just stood there, eyes closed, thinking I might fall asleep right then and there. I stood there for perhaps three or four minutes and then resumed the trek back into Marina to collect another receipt to prove my passage. And then something amazing happened: The wind turned. In fact, it started to feel like even a bit of a tailwind. Whether it was only because of the wind or because I'd finally eaten enough at the past two stops, I started to feel good again, and I was cruising at a good 18-19 mph as I went past the artichoke stop. This was good for another reason: The sun was quickly setting, and I was hoping to be past the rough farm roads while I could still see clearly. I lost a few precious minutes when I stopped to put my night-riding gear back on -- and a group of four of the remaining riders passed me. Next was the 6-mile stretch of two-lane Highway 1 from earlier in the day, but this time we had to make a left turn across traffic to get on the highway! I had almost caught up to those four riders as I saw them wait for minutes to make the turn; when I got there, a miraculous gap in traffic opened and allowed me to cross almost immediately. Just past Moss Landing, I stopped at the last gas station before the Santa Cruz metro area (which also required a left turn against traffic); the few minutes I spent there meant that it was completely dark by the time I returned to the last couple miles of Highway 1. After another scary left turn, I was on the agricultural backroads ... in the dark. I knew from experience that they were unusually rough, and they were completely unpainted, with no centerline and no painted shoulder lines. Fortunately, they were mostly straight, but this didn't make things any easier. My speed went way down as I tried to steer around the biggest holes and bumps, trying to stay on the paved surface. Anytime a vehicle approached from either direction, I tried to get as far to the side as possible and slowed almost to a stop. And the street signs were of almost no help in the darkness; if I didn't know the roads so well from ALC, I surely would have missed a turn (which I did at one point anyway, although I quickly caught myself within less than a tenth of a mile). The wind had all but stopped by the point, and there wasn't any fog or low clouds -- making for an eerily still night that was interrupted by just my headlight and the once-every-few-minutes sound of an approaching vehicle. Sounds romantic, but it was the most nerve-wracking part of the entire day. Seasoned randonneurs -- of which I clearly am not one -- know that a helmet-mounted headlight greatly helps in identifying street signs and other road hazards. And in reading one's route sheet and cycle computer, both of which were useless in the dark. Only once did I actually go off the pavement and into some dirt, when what I thought was the next turn on the route actually was just a service entrance into a field. The only thing keeping me going at this point was the knowledge that I was too close to give up. I repeatedly did the math: if I have five hours to go and just 20 miles, then I can average 4 mph and still make it, etc. 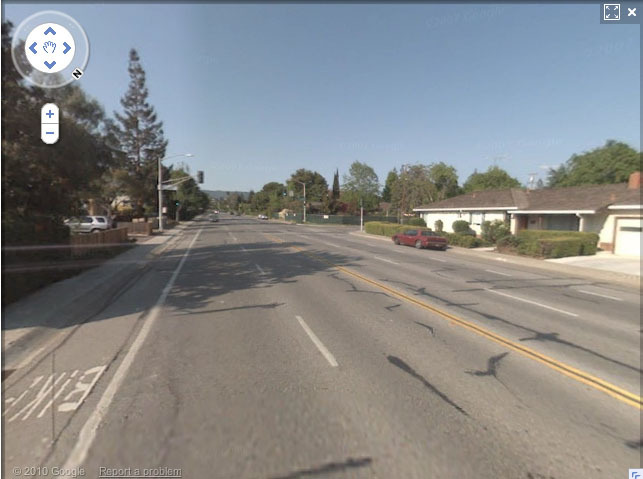 I finally reached San Andreas Road, which while still agricultural and remote, at least had a painted centerline ... and actual (if narrow) bike lanes. The road slowly rises as it approaches the coast, drops back down all the way to sea level, and then climbs back up the ridge before entering Soquel. I took the hills at little better than walking speed, and I took the descents even more cautiously than usual for me -- which turned out to be a good thing at one intersection near a landfill or something like that, where most of the bike lane had fallen off the road and down the side of an embankment! I fortunately spotted the problem soon enough and passed by without incident ... but again worried about whether my $60 headlight was up to the task. After one last steep climb paralleling Highway 1, I finally arrived at Soquel Avenue and the beginning of metro Santa Cruz. The streets were more deserted than I had expected, but the sound of numerous bars and parties -- and more than a few police sirens -- filled the air. I found a gas station restroom that was big enough for me to bring my bicycle inside. Every little hill by this point felt impossibly steep, and I was taking more than a few breaks by the side of the road. But I could taste success by this point, and nothing was going to stop me -- not even the very steep climb from downtown back up to Mission Street. From there, a short jaunt through a residential area brought me to the finish line at the brevet administrator's house. Adam was there to congratulate me (we'd stayed in contact via text message), and after a couple minutes of pleasantries (which mostly consisted me of uttering some choice obscenities about the just-completed ride), I walked into the backyard, where the administrator was waiting and recorded my official finishing time of 11:06 p.m. -- 17 hours and 6 minutes after the start, well within the 20-hour time limit. My odometer read 193.7 miles at an in-motion pace of 13.7 mph. That, of course, didn't count the first few miles that didn't register. So with an official distance of 193.5 miles, I ended up close to 198 miles. Did I want to go for the full 200 miles? Some riders apparently went around the block a few times to do so, but I did not. With an off-kilter computer, even the extra miles wouldn't have enabled me to post a picture of the computer displaying "200.0," so I decided it wasn't worth the trouble. Moreover, I realized a little later that I hadn't even gotten my picture taken at the finish! When I completed the Ride Across Indiana, my mood was triumphant; on this 300k, however, I was merely relieved that it was finally over. Although I offered to drive home, Adam correctly surmised that I was probably in no condition to do so, and he took the wheel and safely navigated us back to Mountain View, where we arrived at about midnight, almost 19.5 hours after we left. I don't think either of us had much difficulty falling asleep. As I write this on Sunday afternoon, I hurt in ways that I haven't hurt since my early ALC days. The legs feel like they're totally spent, a nagging low-level headache won't go away, I'm hungry but don't feel like eating much of anything, and I've already taken a three-hour midday nap. But all of that is probably short-term difficulty, and I think I survived the ride in reasonably good fashion. As I feared, my lighting was not adequate for unmarked rural backroads. And I still haven't fully mastered the tricks of long-distance nutrition; my pace and mood both fluctuated wildly according to what was in my system at different points during the day. Kudos to Santa Cruz Randonneurs for a good route; if I hadn't done it so many times before, I would have found it especially scenic. And although the 5,000 feet of climbing was certainly challenging, it really wasn't all that bad by typical century-ride standards. 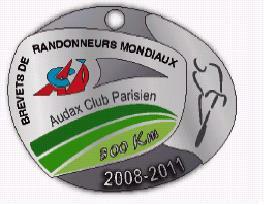 After my brevet card is sent to France and certified, the results will be posted at Randonneurs USA, and I'll be able to shell out some cash for my coveted "300km" medal. I'm glad I did the ride, although the day has put me back into the frame of mind where I wonder why I keep doing this. I could go on for hours about the topic, but it wouldn't be anything you haven't seen in this blog already. The next level in randonneuring is a 27-hour 400-kilometer ride, and there just happens to be one in Santa Cruz in just two weeks, taking the Buena Vista route and tacking on some extra distance. Will I be there? Not a bloody chance. In preparation for this weekend's 300km attempt, I've been getting reacquainted with the pleasures and challenges of night cycling. A key part of this involves choosing the best headlight. I had a few headlights sitting around from past random attempts, and I ended up buying two in the past two weeks. My results were surprising! My requirements are simple: I need a light that will give me at least six hours of runtime; this rules out most lithium battery-pack models. I don't want to spend a lot of money; I don't plan to do enough nighttime riding to justify the expense. And I need not just to "be seen" by other road users; I need "to see" as well, especially since part of the route is on lonely farm roads that probably will be very, very dark indeed. Viewpoint Gen3, one of the house brands of Performance Bicycle, purchased in 2005 or 2006 ($50?). Planet Bike Blaze 0.5-watt LED, purchased in 2008 ($30?). Cateye HL-EL320, purchased last week ($40). Cateye HL-EL530, purchased this week ($60). Cateye ML-373 halogen, an ancient relic from my previous bicycle life, purchased circa 1995 ($50?). This isn't a scientific test, but I used each light on an object about 20 feet away -- namely, the front door to my apartment, in an otherwise darkened room. I took a photo of each test, and I didn't do any color correction or adjustment on the images. Pay attention to two things: the intensity of the main beam, and the total area of the beam. Click on the photos to see larger versions. No, that's not a mistake. The 15-year-old halogen clearly outperforms even the latest state-of-the-art LEDs. Yes, I was shocked, too, because I wasn't even going to include this old light, since I haven't used it in so long. It does have one minor flaw: It eats batteries like nobody's business. I seem to remember getting a maximum of two hours of run time out of four AAs. Of course, carrying extra batteries isn't a big deal. As an aside, it's worth noting that the Planet Bike light interfered with my wireless cycle computer, rendering it useless any time the light was on while riding. None of the other lights had that strange property. Going into this test, I was prepared to say that the HL-EL530 made me very happy when I used it on an extended nighttime ride into Portola Valley. Its main beam is clearly much brighter than the HL-EL320, and it disperses enough that I was able to scan to my left and right while riding for any possible hazards. But now I'm thinking that perhaps I should test my ancient halogen as well. And in any event, I now have all sorts of emergency lighting for the next power failure. My dislike of big hills is legendary by now. So why on earth did I sign up for an 81-mile Seismic Challenge training ride with about 5,800 feet of climbing? I think the reason was to build some much-needed confidence in advance of next weekend's 300-kilometer attempt (which just happens to have about the same amount of climbing, but spread out over the much larger distance) ... or to talk myself out of even trying. Fortunately, today's ride went well. Moreover, half of the route was on roads I'd never cycled before -- a rare treat. To get that far out of town, today's starting point was way up in San Rafael, which meant a drive of more than an hour in the early-morning fog and drizzle beginning at 6:15 a.m. But the benefit was that we skipped all of the nasty, cringe-inducing, crowded cycling conditions in southern Marin County that without fail put me in a foul mood. In fact, there were very few cyclists on the road (by Marin standards) all day long, which was an especially pleasant surprise for mid-"summer." 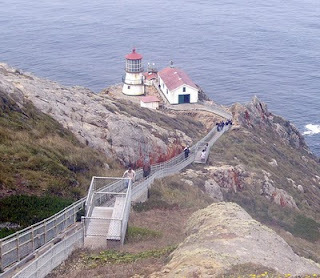 Today, although I had vowed to maintain a steady, mid-range pace, within a couple of miles I was by myself and riding faster than I expected -- I was just under 15 mph by the time I reached the first rest stop in Point Reyes Station at mile 20, even with the chilly fog and a few bursts of annoying drizzle. Although the terrain was by no means flat, it didn't bother me much at all, and I actually enjoyed riding around the Nicasio Reservoir. 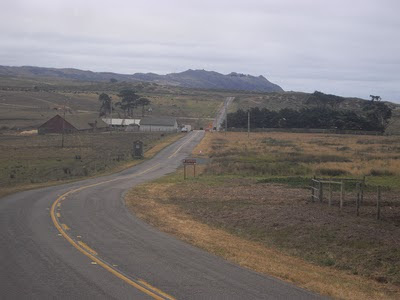 But the route beyond Point Reyes Station was why I traveled all this distance. I'd driven it only once before, a few years ago, and this would be my first time there on a bicycle. The scenery is about as close to Scotland as one can get in the United States (there's even a little hamlet called Inverness), and the surroundings are surprisingly desolate. The much-promised "rollers" along this part of the route were actually more like little hills; in fact, the closer I got to the coast, the steeper and more challenging the hills became. Amazingly, the hills did not put me in a bad mood, and I didn't hesitate to take quick stops when doing so felt right. Moreover, there was almost no wind from any direction, which is extremely unusual on the Point Reyes peninsula; according to the National Park Service, "Point Reyes is the windiest place on the Pacific Coast." I felt that I might have slightly overexerted myself, and the ride back -- along the exact same route, but in reverse -- was somewhat more challenging. I was keenly aware of this, and I reacted properly by taking short breaks every 10 miles on the way back and trying some new nutrition strategies. (I think I'm in love with Extreme Sport Beans!) This got me back to San Rafael in 7 hours and 5 minutes of elapsed time at a pace of about 13.7 mph, which certainly boosted my confidence for next weekend. Moreover, the hills didn't put me in a bad mood (well, except for maybe the last hill before the lighthouse), so that counts as a win as well. Today's pace translates into a pace of about 16:30 for 300 kilometers, which is well within the 20-hour time limit ... and might even get me back to Santa Cruz before midnight -- or might even give me time for a quick nap in the middle of the ride! I signed up for the Buena Vista 300k somewhat reluctantly. But after today's ride, I feel at least ready to make an honest attempt to complete it. We'll see how this all turns out next weekend. For reasons I don't fully understand, I have indeed registered for the Buena Vista 300k on Aug. 21. Look for some type of ride report here. Ride time is from 6 a.m. Saturday until roughly 2 a.m. Sunday, and it is safe to assume that I won't be in any shape to write something immediately at the end. 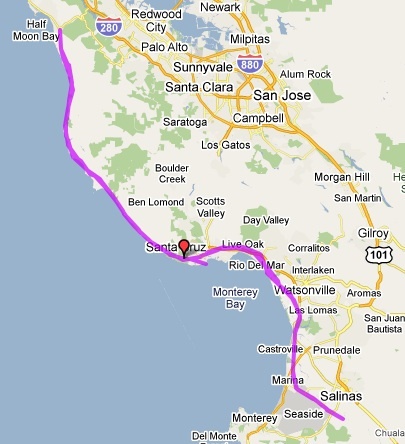 I've been considering riding the Buena Vista 300k brevet in Santa Cruz later this month. The route starts in Santa Cruz and heads up the coast to Half Moon Bay before returning to Santa Cruz and continuing south from there. 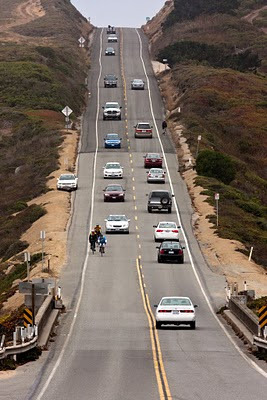 That part of Highway 1 is very familiar to me -- it's part of the Day 1 route of AIDS/LifeCycle. And, like so many other parts of the ALC route, I can find it highly annoying when my mind is not in the right place -- lots of tiny, moderately steep hills coupled with high-speed tourist traffic. Today was one of those days. This morning, I drove to Santa Cruz, parked in front of the brevet administrator's house, suited up, and began my northward journey. My plan was to head about 35 miles up the coast to Pescadero and then return, and to do it in six hours or less of elapsed time so that I'd be in good shape to beat the 20-hour time limit on the Buena Vista 300k. Even though I got a late start and wasn't on the road until 9:15 a.m., the low clouds were thick and a steady drizzle was falling -- enough to make me wipe my glasses at least once a mile. Temperatures were somewhere in the mid-50s, which isn't really unusual for the coast in August, but it was a real shocker after the 100-plus temperatures that I've been riding in for much of the past month. As I've written about before, Highway 1 along the coast is anything but flat. In fact, the highway is almost always going up or down in elevation, sometimes gently and sometimes not-so-gently. Whenever there's a river or stream flowing into the ocean, the highway drops all the way down to sea level, crosses the water on a tiny, narrow bridge, and then climbs back up above it all. This happens lots of times. Today, I just wasn't in the mood. I'd seen it all before, the weather was decidedly inhospitable, and the tourists in their rented motor homes sometimes got just a little too close to me. It's not that I was riding poorly; in fact, my pace was about 15.5 mph, which is far faster than needed to make the time cutoffs of a 300k brevet. But every little climb was really annoying me, and I wasn't having much fun at all. So, about 17 miles north of Santa Cruz at the site of ALC's Rest Stop 3, I turned around. My mood improved somewhat, because I then knew how long my ride would be. But I also had to contend with every hill of the day again, just this time in reverse. The drizzle had mostly stopped by that point, but I was still in jacket and leg warmers -- in mid-morning in August. I got back to Santa Cruz in one piece and spent a few miles aimlessly cycling along the waterfront before returning to my car and heading home. What happened? It just wasn't fun anymore. It felt like a job. I wanted to be almost anywhere but there. It almost felt like an ... addiction. So far this year, I've cycled 4,631 miles, which is my second-highest total for this point in the year and just shy of my all-time mark from 2006. With the glorious exception of my vacation rides, nearly every mile of that total has been in places I've been before -- anywhere from a couple of times to dozens, if not hundreds, of times. The question before me now: Do I really want to subject myself to nearly 200 miles of cycling in one day up and down and back up the coast, all of it on roads I've done as recently as June? Do I want to spend up to six of those hours riding in the dark on a Saturday night on agricultural backroads and then through party-central downtown Santa Cruz? Do I want to pay the absolutely outrageous prices for a hotel room in Santa Cruz after the ride? (I could be finishing as late as 2 a.m. and almost certainly would be in no shape to drive home.) Do I want to run the risk of being recorded forever online as a "DNF"? (These things don't go away, y'know.) All for what? The chance to buy a medal that says "300k" on it? More importantly: Do I want to risk illness or even permanent damage? My post-RAIN experience is still very fresh in my mind. I think I was probably in far worse condition that I knew at the time, most likely in some combustible combination of dehydration and exhaustion. I wouldn't get the luxury of a week off after the 300k; I'd need to be back at work and chipper, happy, and active just one day later. The registration deadline for the 300k is fast approaching, and inertia on my part will cause me to miss the date, and the question will become moot. Where I am tonight, that's probably a good thing. We'll see whether that sentiment changes in the next few days. 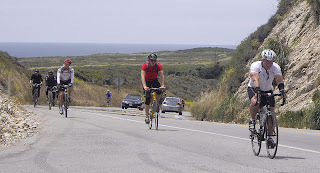 Photo: Riders along Highway 1 during ALC8. The San Francisco AIDS Foundation does vital work to end the suffering caused by HIV and AIDS. In these challenging times, the foundation's funding sources are at risk, and essential services to people in need are in jeopardy. We'll keep riding until AIDS and HIV are a thing of the past.